Crèche Programme » Comhar Chathair Chorcai Teo, Cork City Partnership Ltd. Happy Talk crèche sessions aim at coaching staff in integrating language development strategies in their interactions with the children. Each session includes a focus on listening, skills development and action rhymes. Happy Talk has previously run workshops for staff working in local crèches. These workshops focused on the main Happy Talk strategies: modelling, expanding, and balancing questions with comments, as well as creating an environment for language development. Happy Talk also collaborated with Beag, Graffiti Theatre’s Early Years arts team. The Beag team integrates drama, music and visual arts in their approach with children aged 0-3 years, and Happy Talk recognised that language development could be supported through their approach. Beag ran a workshop for crèche staff, which explored shadow play, sound chamber, vocal gymnastics, creating a sound kitchen and imaginative play. Beag then visited each of the 6 crèches and ran 2 sessions in each. 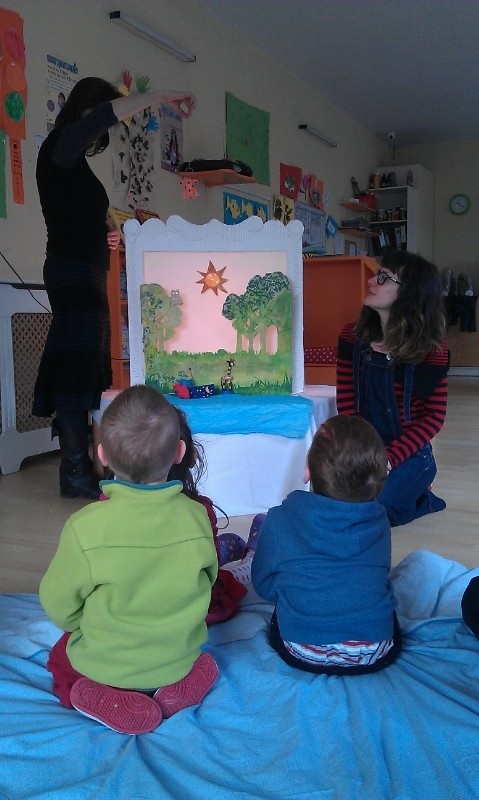 The sessions focused on shadow play activities using a light box and shadow puppetry. They also provided opportunities for developing vocabulary. Shadow Play activities help to develop listening and attention skills. They also create opportunities for exploring sound using musical instruments. Sound activities help to develop listening skills which are the building blocks for language development, reading and comprehension. A short summer course was offered to parents who had specific concerns about their children’s language development. Themes covered included: communication, adding language and taking turns. Following each session, the happy Talk therapists coached individual parents alongside their child in the crèche in collaboration with the crèche staff. The coaching focused on the strategies explored during the sessions.